Thanks to all of you how are serving our country and to those of you who have served, especially those who gave the ultimate sacrifice of their lives. Hip2Serve will be away from the computer thru Monday, May 25th, to spend time with my husband and kiddos. 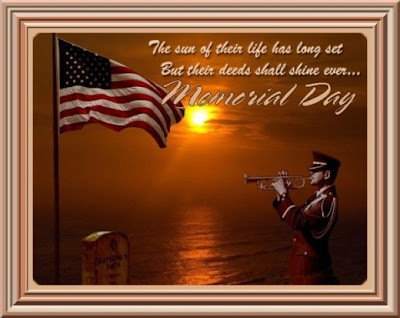 "[Memorial Day] is the day we put aside to remember fallen heroes and to pray that no heroes will ever have to die for us again. It's a day of thanks for the valor of others, a day to remember the splendor of America...It's a day to be with the family and remember."